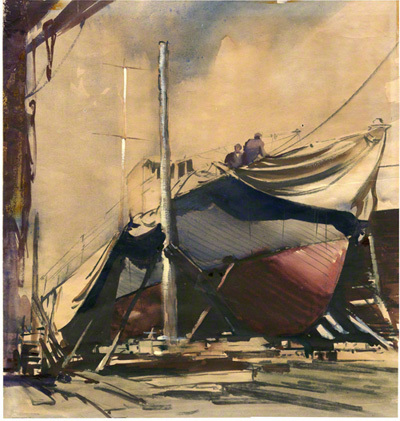 Charcoal and Water Colour painting showing boat being refitted by Claude Buckle. This is a good example of marine in the style of Claude Buckle. Although only a sketch, the painting clearly demonstrates the approach of a contemporary representative style. Charcoal finish to the foreground has been added dating this picture as being in the early 1950’s and may have been exhibited at the RSMA yearly exhibition. The boat is wedged between large upright poles for support. Two figures are repairing the boat. The boat covers can be seen. Claude Buckle has drawn the picture using a charcoal and water colour medium. The large bows of the boat form the main part of the picture. Created in 1953.